Oracle highlights machine learning and artificial intelligence for running cloud services, delivering smart applications and driving data-driven decisions. Here's what's coming. Oracle's new Autonomous Database Cloud will be cheaper, faster and, with the addition of the Oracle Cyber Security System, safer than anything from Amazon Web Services (AWS). At least that's the assertion Oracle Executive Chairman and CTO Larry Ellison wants everyone to remember from last week's Oracle Open World 2017 (OOW17) event in San Francisco. Whether Oracle's claims are fair and accurate comparisons remains to be seen, as the first release of the Oracle Autonomous Database, through a Data Warehouse Cloud Service, won't be available until December. Count on it being at least a few more months before independent reviewers can do independent tests against rival cloud services. It should be about that same time -- six months from now -- that several other data-related announcements from OOW17 will actually be available. Some notable OOW17 announcements are generally available today, such as the Oracle Big Data Cloud, Oracle Event Hub and Stream Analytics Cloud services, and the Oracle Analytics Cloud Data Lake Edition. But whether it's the next round of Adaptive Intelligent Apps, coming artificial intelligence (AI) and machine learning (ML) Platform as a Service capabilities, or a series of Oracle Analytics Cloud upgrades, many of the more interesting announcements from OOW17 will emerge over the next three to six months. Here's a rundown on nine announcements to follow over the coming months. Winning the cloud war is, of course, crucial for Oracle. Oracle has 480,000-plus customers, and it's No. 1 product, hands down, is Oracle Database. If there's a cloud equivalent to the domino theory, it's that as cloud database selections go, so go the rest of a customer's cloud choices. Thus, Ellison's better-faster-cheaper performance and cost claims were on display all over OOW17. He also told attendees that with discounts, the database service will start at as little as $300 per month -- though the 1-CPU to 1 terabyte-of-data specification seemed anemic, to say the least. In CEO Mark Hurd's keynote we heard that only about 14 percent of production workloads are now running in public clouds, but given growing cloud momentum he predicted that 80 percent of production workloads will be in the cloud by 2025. The lion's share of today's database marketplace is Oracle's to lose, so there's huge pressure to prevent customers from even thinking about alternatives like Amazon RedShift or Amazon Aurora. The (according-to-Oracle) cost and performance claims flashed all over OOW17 were a "stick with Oracle" message to on-premises customers now considering the cloud. Analysis: It's important to recognize that the Oracle Autonomous Database Cloud is just that -- a cloud-based service. Oracle Database 18c software, when it arrives, won't have inherent Autonomous capabilities. 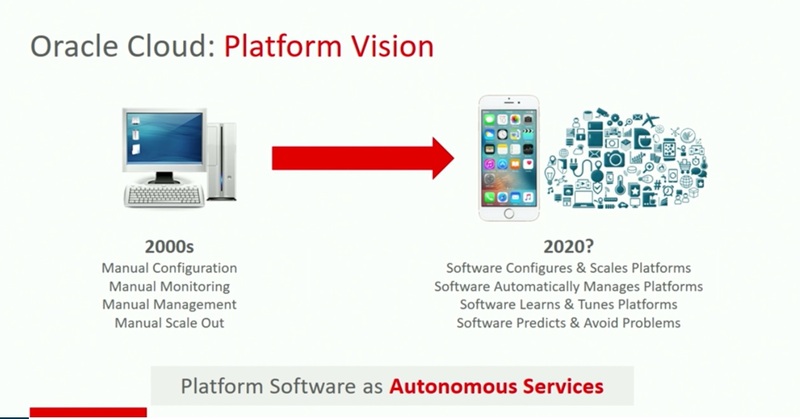 To be Autonomous it has to be delivered as a service by Oracle. The same goes for the on-premises deployment option, which won't be Autonomous unless it's delivered "Cloud at Customer" style, with an Oracle Cloud Machine deployed in customer data centers but managed by Oracle. Oracle has been talking for at least a couple of years about the efficiency it gains through automation in the cloud, but the Autonomous Database Cloud is said to bring these advantages to while new level. Time will tell just how much extra oomph the ML-driven Autonomous tuning and optimization delivers compared to like-for-like Oracle 12c database services. As for those tests results versus Amazon, the comparison of Oracle Database on Oracle Cloud vs. Oracle Database on Amazon is a shoe-in for the home team given Oracle's ability to run the database on Exadata, which is not an option for Amazon and which pushes down query processing to the storage layer, thereby reducing the load before the query even gets to the database engine. Oracle DB on Exadata vs Redshift on Amazon is more of an apples-to-apples comparison. Here's where I'm eager to see independent test results. Assuming that ML-driven database automation offers advantages -- and I'm sure there will be many -- the good news is that Oracle has a slew of other autonomous database services in the pipeline, including Autonomous OLTP, expected next June, and Autonomous NoSQL and Graph database services likely to show up by OOW18. Announced rather quietly at OOW16, Oracle Adaptive Intelligent Apps are a family of cloud-based, machine-learning powered apps that are integrated with Oracle cloud applications. The company spent the first half of 2016 putting the required machine learning data pipelines in place. Using a combination of customer-specific SaaS data and third-party enrichment data from the Oracle Data Cloud, Adaptive Intelligent Apps will deliver customer-tailored recommendations that will improve decisions, outcomes, and business results. Generally available today are Next Best Offers and Recommendations, a subset of Adaptive Intelligent experiences coming to the Customer Experience (CX) Cloud. Following the roadmap laid out last year, Oracle announced Adaptive Intelligent Apps for HR, ERP, and Supply Chain Management at OOW17, but nobody was predicting release dates for this next wave of smart apps. Analysis: Oracle Adaptive Intelligent Apps for CX are just getting out of the gate. Two customers on hand at OOW17, Team Sportia of Sweden and Moleskin of Italy, both said their deployments were just getting started. This is later than I anticipated in my 2016 report on Adaptive Intelligent Apps, but Oracle always conservatively said these apps would debut "within the next 12 months." Oracle's chief rival on this front is, of course, Salesforce Einstein, which saw lots of splashy announcements in 2017. I'm anxious to hear testimonials and deployment details from Salesforce Einstein customers at the upcoming Dreamforce event in early November. I'll be surprised to see new Oracle Adaptive Intelligent Apps outside of the CX arena through the first quarter of 2018. I've learned to be cautious, so I'm guessing those HR, ERP and SCM smart apps are at least six months away and likely to debut in limited release. Oracle is some cases keeping up and in some cases catching up with state of the market on the big data and artificial intelligence fronts. This summer Oracle announced the Oracle Big Data Cloud, which is a big data platform based on Hadoop and Spark and closely aligned with the ODPi standard also used by Hortonworks, Microsoft, and IBM. Oracle's previous offering, the Big Data Appliance based on Cloudera, is still available both on-premises or as a hosted service. But the future focus is clearly on Oracle Big Data Cloud, which separates storage and compute decisions and offers object storage as a low-cost alternative for high-scale data lakes. On the streaming front Oracle has added the Oracle Event Hub, which is based on open-source Apache Kafka, for routing and processing. Oracle Stream Analytics is a rewrite of the company's complex event processing technology that now runs on Apache Spark. 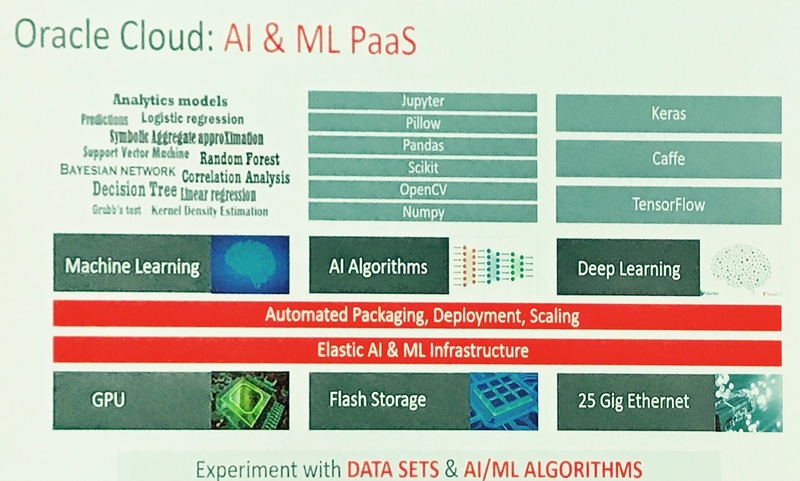 On artificial intelligence, Oracle President Thomas Kurian introduced a new AI & ML PaaS that will offer GPU compute capacity (both bare metal and VM) and a variety of open source AI frameworks, including Caffe, Keras, and Tensorflow. Developers will be able to work with a variety of languages and notebooks. As for the AI & ML PaaS, it was announced at OOW17, but it's not yet available (as per Oracle's site). Based on conversations with executives and various roadmap slides I've seen, I'd expect the AI & ML Pass to be available within three to six months. AWS, Google Cloud Platform, and Microsoft have all had GPU capacity available for some time. On model development and deployment, Microsoft last month introduced the beta preview of its next-generation Azure Machine Learning portfolio that promises end-to-end model lifecycle management. My take is that Oracle is still catching up on AI cloud services and capabilities. Here's another area where Oracle is moving quickly to stay in step with the market. Evolving beyond the Oracle BI Cloud Service and Oracle Visualization Cloud Service announced three years ago, the Oracle Analytics Cloud combines these two services and adds more to create a more comprehensive collection spanning data discovery, preparation, analysis, and prediction. Standard and Enterprise Edition subscriptions were previously available. Oracle introduced a Data Lake Edition at OOW17 with subscriptions based on CPUs rather than users, thereby encouraging broad adoption. Oracle announced a series of machine-learning and natural-language-processing-based enhancements to the Oracle Analytics Cloud at OOW17 and they'll be available over the next three to six months. Automated Data Diagnostics is an "Explain" capability that will surface hidden drivers and guide users to data and analyses that they might not know to look at. Natural Language Insights will generate plain-text analyses of salient points on a chart, helping uses to focus on what matters. Improved "Ask" Natural Language Query capabilities will support synonyms and abbreviations and dynamically correct and reinterpret queries as you type. Oracle is also working on Enhanced Data Catalog capabilities including search and navigation across metadata and social tags as well as automated recommendations on related and relevant datasets to promote discovery. Analysis: Oracle Analytics Cloud seems to be on a path that's similar to Microsoft PowerBI and Azure ML. Both vendors have created comprehensive portfolios and are seeking to leverage the strengths of their respective clouds and data platforms. The updates and enhancements announced at OOW17 mostly match state-of-the art capabilities that are already available in the market. For example, Oracle's "Explain" feature is akin to Salesforce BeyondCore and a similar feature embedded in Microsoft PowerBI. Natural Language Insights is akin to Narrative Sciences capabilities that Qlik and Tableau have both leveraged. State-of-the-art natural language query is available from multiple vendors, including Microsoft, IBM (Watson Analytics) and others. As always, I came away from OOW17 impressed by the sheer breadth of applications and technologies available from the company. Oracle may not always be the first to introduce state-of-the-art capabilities, but it's always the top competitor cited by rival database and data-platform vendors. The company's sheer market presence in data platforms and applications puts it in a great position to also lead in analytics and coming smart applications. The key question, as with so many vendors these days, is how successful the company will be in transitioning existing customers to the cloud. The surprise in the applications arena is just how many all-new, greenfield customers Oracle has won with its SaaS applications. CEO Mark Hurd insists that Oracle's core database business is outpacing the rest of the market, but that's a licensing and subscription measure whereas I'm seeing a lot of open source growth that can't be measured by the same math (even if the software is commercially supported). Refreshingly, Oracle's big data, data integration, and analytics executives all seem to be hip to the open source movement. OOW17 saw a broad embrace of open source software, from Hadoop, Spark, Kafka, and Cassandra (the latter by way of a partnership with Datastax) to Python, R, and various open source deep learning frameworks. There will always be that Oracle bravado about its most successful commercial offerings, but I see a company that's increasingly moving in step with a changing world of data platforms and technologies.